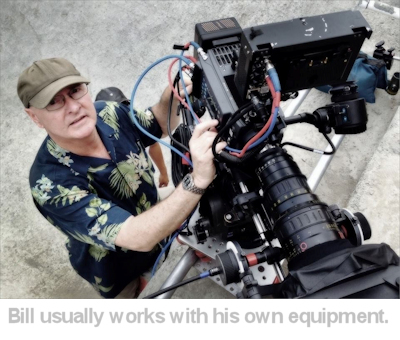 Bill has been a USA-based Cinematographer for 20 years. Starting out as a carpenter on set, but always with the intention of making it behind the camera, he made his way up to the top of his profession and now works with clients like Audi, Land Rover and Apple. 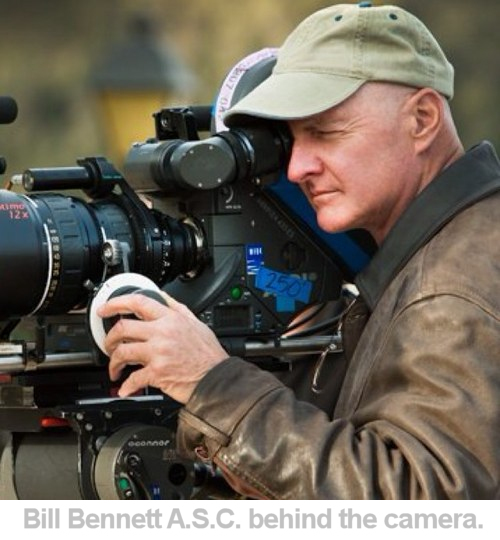 Bill recently received the President's Award from the American Society of Cinematographers. How did you get started in filmmaking? Did you start with film or photography? I started shooting stills for my high school newspaper, in San Antonio Texas, where my family lived at the time. Then, I saw what were called at the time, "multi-media” productions, that used several slide projectors, and sometimes also film projectors, projecting multiple images, typically to music, or narration. That caught my attention, so I started shooting those with stills, then integrating 16mm movies into the productions. I attended Trinity University in San Antonio, Texas, initially in the engineering track, but then changed to the live theatre track. While I was there, even though they were still developing the “film” department, I shot several student films, using the people in the drama department as crew and actors. Upon graduation, I moved to Los Angeles, in 1974 to make my way in the film business. At first I couldn’t break in shooting or even camera assisting, so I took work as a set carpenter. Through that work, I met genius Director / Cameraman Ron Dexter (now an ASC member), and started working my way up through the ranks, first as Grip, then Key Grip, then Camera Assistant, then Operator. Eventually I moved out on my own as an Operator, then started getting Cinematography work. That process took about 10 years, but I loved every minute of it, and learned a tremendous amount from Ron the entire time. You didn't go to film school, do you think you missed out on anything or perhaps it helped? While I didn’t have training directly in a "Film School” department at a university, I did graduate Trinity University with a BA in Drama, which encompassed acting, directing, lighting, writing, speech, sound design, etc, so there was a lot of useful skills learned there, and I started using all the cameras and post production equipment at the as-yet unopened Film Department, so I guess I had the best of both worlds. But, I didn’t have any formal “film school” training. I had something even better: real world training under my mentor Ron Dexter, ASC. What opened doors for you to make a start in filmmaking? Being there. But it was more complex than that, you had to "be there" at the moment of opportunity, but prepared with the set of skills that would enable you do do well on that job at that moment, which would then enable you to be successful, and have the Directors and Producers hire you for an even greater challenge the next time. At what point in your career do you call yourself a cinematographer as opposed to cameraman? When I was invited into the American Society of Cinematographers, it became evident that I was indeed a “cinematographer” and started calling myself one. You specialise in commercials, why did you choose this avenue rather than TV or cinema? TV commercials are a fast-breaking production world, with jobs being awarded, and starting production a week or two later. The TV episodic, and Feature Film worlds work on a much longer time frame, both with lead-time before the jobs, and long term commitments to the jobs, sometimes half a year, or more. If I were to take a feature or TV series, all my regular commercial clients would quickly invoke the “three strikes” rule. While it is true that many feature film and TV cinematographers do TV commercial work, it is not the main thrust of their career, but rather they do them “in between” their major work on features or TV series. That, and I really enjoy the work in TV commercials. It is very challenging. More money is spent per-second of screen time, compared to any other medium. But, at the same time, for that money, the agencies and clients expect perfection, and therein lies the challenge. We travel all over the country and the world. I’ve shot on every continent except Antartica. We rarely go to ugly places… they are typically quite beautiful. You work with cars, planes and bikes. Is this something you are passionate about outside of the work and how important is it to your work to have that passion? I am a licensed pilot, and own a airplane, a Beechcraft Bonanza A-36. My father was a pilot in the US Air Force, as were several of my uncles and cousins, so there has always been a tradition of flying in my family. Before I got my pilot’s license, I flew hang gliders for 10 years. My longest cross-country flight in my hang glider, non-stop, was 103 miles, launching from the Sierras south of Mt Whitney, and landing in Nevada, north of the White Mountains, in an unpowered 70 pound hang glider. For a while, I owned an Acura NSX, their limited production sports car, but never drove competitively. But, my vehicles are typically utilitarian pickups or SUV’s. The fact that I am a licensed and trained airplane pilot does garner respect from the other pilots I work with doing aerial cinematography, in that they know I understand the limitations of aircraft performance, safety procedures, and FAA rules with regards to where you can go and where you can’t. It’s like any other highly skilled field, you know in 15 seconds of talking to someone if they know what they are talking about, or not. It’s not essential to be a pilot to do aerial cinematography, but it certainly helps. Why do you think international clients like Apple and Audi ask you to work with them? Because I am very good at what I do! And, I deliver consistently high quality images. You have a massive collection of specialist equipment to call upon for your work, why do you prefer to have your own gear rather than hiring in? This was something I learned while working with Ron Dexter. He was the same way. He owned many film cameras of different capabilities, mostly 35mm, but some 16mm, and countless lenses, some typical, and some very specialized and modified. Because I own my own equipment, I know the condition it is in, it’s available when I need it and the town is busy, and it says a lot about your commitment to your craft when you invest in the highest level tools. I also have a complete machine shop, with a lathe, mill, bandsaw, etc, so like Ron, I can easily make a modification to a lens, or build a rig, often the night before the job. I also have an electronics shop to modify components, make and repair cables, connectors, etc. Cinematographers have a huge influence on the look of a film and yet many people know little about the role. Why do you think that is? The cinematographer always works in collaboration with the Director and by definition allows the Director to be the leader and sole final authority of the look and feel of the project. We are working for them. What do you love about the job and what do you hate? I love the challenges, the beautiful locations, the terrific people I work with. I love seeing the finished results after a challenging shoot. I guess, I hate the 3:30am wake-up calls, to go catch a sunrise in some northern location in the summertime. But, I have done that countless times. Do you have one piece of work of which you are most proud? There are many. I am really proud of the work I did with Director Brent Thomas of Coppos Films, as well as the work I did for Gary Johns and Jeff Gorman of Johns + Gorman Films. Lately, I am quite proud of the work I have done with Andrew Sinagra of Ntropic, (See film above) where we integrated beautifully crafted CG automobiles into real locations. What advice would you give to someone wishing to pursue cinematography as a career? Be as prepared as you can, and be there. Work as much as you can, even if it has to be for free, or low wages at first. Like I said earlier, you have to present yourself ready to successfully take on the challenges offered you. If you succeed, you will be offered further and greater challenges, if you fail, you won’t be hired again. It’s that simple. "Never pass up the opportunity to keep your mouth shut.” Listen, watch and learn. When some drama is happening on set, don’t get involved if you can at all avoid it. And, if you can’t avoid it, “No one remembers what you didn’t say. But they will forever remember some hurtful thing you blurted out in the heat of the moment." They say don’t work with children or animals. Tell us about giraffes. Yes, that is accurate… there are times when everything magically comes together, and it is up to you to not panic in the moment and screw it up. Making a commercial for Range Rover and emulating the style of "Raiders of the Lost Ark" in the "somewhere in Africa" bar scene. The shot of the hill with the lone tree, and the giraffe was difficult to shoot, because the giraffe had no concept of where the edge of the frame was, and kept wandering off. The trainer would take him up by the tree, then turn him loose, and hide behind the tree. We finally got a take, where, as the car drove by, I panned with it, and the crane rose up, and I saw the giraffe walking down toward us, and into the frame. All I could think at the time was, "Don't screw up the framing, don't jerk to a stop!." And it was perfect.